After seeing the powerful short-film Butterflies and interviewing director Cady McClain, I'm so excited to be chatting with Carlotta Summers herself, writer, producer, & star of this project! The film has already won BEST SHORT FILM and BEST ACTRESS for a short film for the Philadelphia Independent Film Festival, 2018. 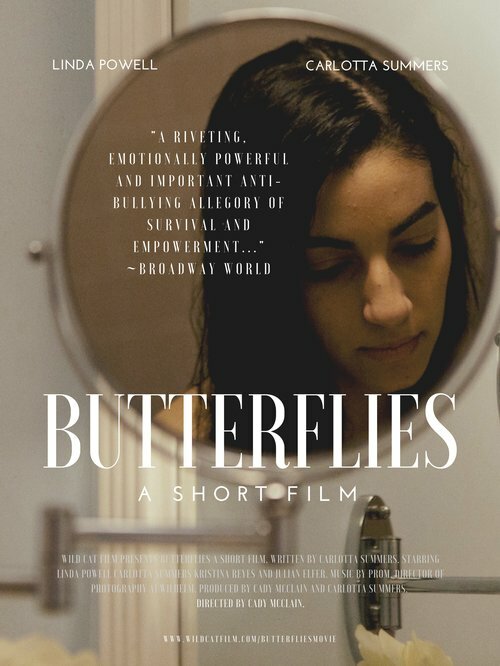 Butterflies will have its Queens Premiere in the upcoming Kew Gardens Festival of Cinema on Saturday, August 4 at 6pm at UA Midway Theater (108-22 Queens Boulevard, Queens, NY). Click here for tickets! For more on Carlotta visit https://www.carlotta-summers.com and follow her on Facebook, Twitter, and Instagram! 1. What made you want to write Butterflies as a short film as opposed to a feature length? Butterflies actually started out as (and still is) as a feature film that I wrote based on my own experiences with bullying in grade school. I started writing the feature four years ago after graduating college, when I found a majority of the roles I had been sent out for weren’t as compelling. I wanted to write a character, who after facing great emotional pain, overcomes it, while helping to empower young women who have had similar experiences with bullying. After writing the feature film version, I realized that there was no way I could fund this on my own! So, I decided to condense the feature into a short film. My hope with Butterflies is, ultimately, to empower other young girls who see themselves through the eyes of this character. 2. Directing this film is All My Children alum Cady McClain. What made you want Cady to direct this film? Yes, I remember seeing Cady on All My Children! I was really drawn to her performance at the time, and later, researching her body of work, I found that she had the perfect aesthetic for the piece. As I was writing the short version, I met Cady through a mutual friend, and we kept in touch. I also found out that she was also working on a documentary about female directors called Seeing Is Believing: Women Direct. I loved her passion for her craft and the fact that she was also working on a piece to empower other women. We hit it off instantly and the rest is history! 3. What do you feel Cady has as a director that someone else did not to authentically tell this story? Cady is a brilliant director. She knows how to draw a compelling performance from an actor, and I am lucky to have had the opportunity to work with her! I think that her acting experience prepared her for better communication with actors, and this helps get what she wants to the screen. You don’t find that many directors who have a gift to communicate with actors. I felt completely safe with her in the most intimate moments and that allowed me to really sink in and open up! 4. In Butterflies, "Melanie's" journey is compared to the lifecycle of a butterfly. How did you decide to relate this story to that of a butterfly's life cycle? You know, my Dad is actually really into science and I think that’s where my curiosity about nature comes from. I think that the butterfly is a fascinating creature. From an outsider’s perspective, it’s almost transforming against its will. Like the character, "Melanie," I am interested in how, on a molecular level, something can completely reshape itself and then reemerge as something so majestic. Popular culture is fascinated with the beauty of this metamorphosis when in fact, inside of the chrysalis, the process is actually quite aggressive. Once in its chrysalis the caterpillar actually digests itself little by little and then puts itself back together again. I thought that was a perfect allegory for the complexity and the almost divine will of change, especially in adolescence. It’s also a lot like what we go through when we experience a trauma, such as that caused by bullying at a young age. As a child, we start out as a blank slate, then something can happen that can completely change our perspective on life. What the caterpillar consumes often shows up later in the wings of a butterfly, just as how past experiences can also make us who we are today. There are a lot of similarities between humans and nature. I wanted to show the possibility that something so painful can lead to something very beautiful, and this gives us hope. 5. From Mariah Carey to Dolly Parton to Debbie Gibson, they all have songs written about butterflies. What do you think it is about butterflies that make them so relatable to art - songs, movies, etc.? With each generation, art continues to have a cultural rebirth. I think that the butterfly represents this change. And it’s not a slow change, it’s a gradual, sometimes painful change. A lot of what we face as humans, is both painful and gradual and it helps shape us. There is the beauty of the butterfly but also its fragility, which symbolizes the very sensitive nature of human emotions. People relate to this in terms of metamorphosis, so I think that is the alluring subject matter especially for artists. 6. Without giving too much away, my favorite scene in Butterflies is when "Melanie" wraps herself in the blanket which is representing that of a cocoon. What was it like filming that scene? It was actually a lot of fun! Cady wrapped me up in this ball, so I’m actually as snug as it appears. There’s that saying, “as snug as a bug in a rug,” and that’s pretty accurate! We originally used a similar shot for our Seed and Spark crowdfunding trailer and we liked it so much, we decided to keep it in the short. We wanted to create this sense of intimacy within the shell "Melanie’s" in, after an emotional scene involving "Melanie's" mother. I think it works great! Linda Powell and Carlotta Summers in "Butterflies"
7. My favorite line in the film is "I have the right to exist." It's said over and over throughout the movie. When was there a time in your life that you had to tell yourself this everyday? I still try to tell this to myself everyday. We all have our moments where we feel overwhelmed and insignificant. I think it’s important to remind ourselves why we are here and that we have the right to take the space. Especially those who are struggling with self confidence issues and anxiety. There are a lot of mental ailments people are battling. I think that a reminder that when you’re staring into the face of something you can’t control, taking these little steps to acknowledge the beauty of existence can help. 8. In this hate-filled world that we are currently living in because of you know who, how do you feel Butterflies can help people feel love? This is a really good question that we are still finding the answer to. I think that the overall message of the film gives a sense of hope in the face of oppression. "Melanie" is fighting not only the bullies around her, but her own inner demons. Her ability to persevere and find a sense of self love, is a powerful message. It starts with the person inside. You can’t change someone else, but you can start by making the change within yourself. There is also a section of the film that deals with race and perception which I think are both important topics. It’s when "Melanie" is identified as mixed and another character responds, “Well, she looks Hispanic, so that’s what she is.” I think the fact that she ignores the truth, in favor of a simplest explanation, as she understands it, and in favor of a generalized stereotype really speaks to the heart of what is happening in our politics. You are that thing, because I say you are, despite the facts presented. I will ignore the truth in favor of my own beliefs. It seems ridiculous in this context, and I even had a friend after a viewing, say that they didn’t understand this experience, because they never had to deal with it. I think that it’s important to realize that the truth isn’t something you create, it's something that we must search for and not be afraid of, even if it challenges our core beliefs. Carlotta Summers as "Melanie" in "Butterflies"
9. What was the hardest part of this short to write? I find writing to be really cathartic. Ever since I was a young girl, I was encouraged to keep a journal. Anytime I had creative inspiration I would write in it. Every time I had something I wanted to say I would write in it. It’s actually more of a challenge for me to stop writing! It was also challenging to embody the character after years of having been removed from the situation. Cady was integral in helping me get back to the emotional core of the character. She has an intuitive way with actors that brings out the best in their performance. 10. What are your hopes for this film as it is starting to get out there for people to see - meaning, do you want some kind of social growth to result from people seeing this film? Are you hoping this film helps expand your career in a certain way? Was this a film you just needed to make for yourself to get something out of you? Butterflies, the short film, is a condensed version of a feature film I wrote of the same name. My hope is that we can fund the feature. This is also the start of many film projects I am currently working on that I am excited to share with the world and I hope to continue to create compelling works for years to come. If this film can reach one person who has been hurt, one person who is hurting, or one person who thinks about hurting others and affect them in a positive way or motivate them, then I have done my job. There have been some dark moments in my life. If I can show that one person that there is hope, for them to hold on, then I am happy. That is what I hope for this film. Carlotta Summers is a multitalented, biracial, theatre trained, award winning Actress, Writer, and Producer currently living in NYC. CEO of her own production company Wild Cat Film. A graduate of NYU’s Tisch School of the Arts, a few of her film and television credits include the title role of "Saltire" in Choice Film’s Big Dogs, a Featured role in Shonali Bose, Margarita, With A Straw, & Supporting Role in Lupe. Currently, Carlotta is Associate Producing, Ponyboi Co-Produced by Stephen Fry & Emma Thompson as well as developing several series in her spare time. She has worked with names such as Keira Knightley, William Moseley, Evan Cabnet, Chris Modoono, Linda Powell, David Platt, and Cady McClain.